Jean O’Connor-Snyder Intern Hannah Woodard, living and working in Marion, Alabama this summer, reflects on a sacred community space in her first community journalism article. The mat is located past the church’s broad white columns at the foot of the towering doors leading into the church, aged by white crackling paint and adorned with a door handle of worn brass. 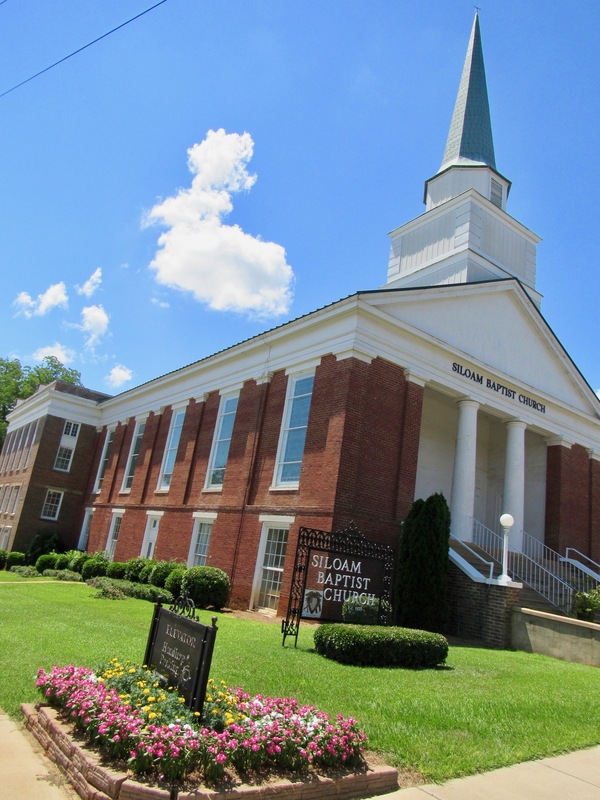 The three-story church where Nicholson preaches was built in 1847 and opened two years later in 1849, but Siloam Baptist Church has been an integral part of Marion since 1822, right around the time the city was founded. Before being at the site of the present-day church, Siloam had two churches near Marion Cemetery, just a few blocks over. Under a canopy of trees that breaks open to reveal a sea of tombstones, a winding one lane path reveals no trace of what Nicholson describes as what was first a “log meetinghouse” and then an “elaborate frame church” where the very first members of Siloam met to worship. In that early frame church, much of Siloam’s faith was able to manifest under the leadership of preacher Charles Crow into organizations that exist today. The only remaining piece of that era of Siloam’s history can now be found in the present church up a flight of creaky metal stairs in a room known as the Memorial Parlor. The parlor, dedicated to the history of Siloam in 1958, features a cherry wood table where many of Siloam’s historic moments occurred. Articles known as the Alabama Resolutions that began the Southern Baptist Convention were penned there in 1845. The first meetings of the Home Mission Board, now known as the North American Mission Board, started around this table as well. With its rich history and architecture, the church was added to the list of The National Register of Historical Places in 1982. Around that same cherry wood table in the Memorial Parlor, the drafts founding Judson College in 1838 and Howard College, now Samford University, in 1842 were written by members who desired that the faith found at Siloam be the foundation on which future generations were educated. Siloam, once “the largest church west of Augustus, Georgia”, Nicholson explained, always had a desire to make education a prominent mission. The focus on education led to two three-story additions to the church, one in 1926 and the other in 1959. The exterior brick itself is an indicator that the construction occurred at different times. Long-time member of the church, Inez Barnett, pointed out another sign. “When we finally got the elevator in, it couldn’t make just three stops because the three floors are uneven. There’s a half a stop on the east, and another half a stop on the west, and so on,” Barnett said as she reflected on the installation of the elevator in 2007. Barnett has taught Sunday School at Siloam for many decades, playing a key role in educating the members of the church. She said, “I have more time than anything else, so I like to give my time.” Over the years, she has taught the preschoolers, middle schoolers, college students, and young couples to give them a solid foundation in faith. Walking through the church, Nicholson stops in front of the pulpit, describing the moment when he realized that Siloam was a special place. “When I reached the middle of the floor (in front of the pulpit) to do the invitation, the floorboards underneath my feet creaked and had a little give to them. After the service I realized that, for nearly 200 years, preachers before me had stood in that very spot to give an invitation to know Jesus, and I just thought ‘Wow, that’s amazing,’” Nicholson said with a twinkle in his eye. Viewed from that central point in front of the pulpit, the Siloam sanctuary features three expansive sections of quarter-sawn pews upholstered with emerald green cushions. The pews sit on wide plank wooden floors underneath intricate stained-glass windows. The floors and pews date back to the 1890s, and a closer survey reveals other remnants of the past. Pew numbers in bold black numbers on plaques on the bottom of the pews are indicators of pew taxes once paid in order to retain a certain seat in the sanctuary. The tall walls have a ripple in paint that leads to the suspended balcony located toward the back of the church. The balcony was once a slave gallery with the ripples representing the space where the gallery once extended. After the Civil War, the balconies were removed, and Siloam assisted African Americans with building a church of their own, now known as Berean Baptist Church. E.T. Winkler, a preacher at Siloam in the 1880s, helped train African-American pastors. “Our story is not spotless as far as race relations, but we are making leaps and bounds in repairing those relationships,” Nicholson said.